Sources said the three people in critical condition were riding in the two cars, and three others suffered serious but non-life-threatening injuries. Officials said 19 bus passengers, including the bus driver, had minor injuries. 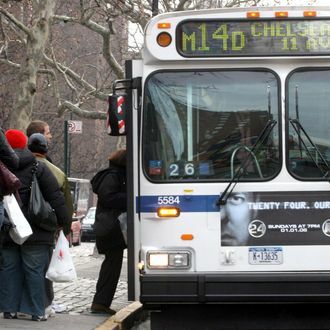 The speed limit on Utica Avenue was recently reduced from 30 to 25 miles per hour under Mayor de Blasio’s plan to reduce pedestrian deaths, but witness Lisa Pendelton said, “The car was speeding.” “It was bad — the poor people on the bus,” she added. “I wanted to go over I could hear moaning and screaming in the bus. I had to look away.” The incident is still under investigation, but police sources said it’s likely the BMW driver will be charged.